By then we noticed that the plugin had full integration with WordPress SEO by Yoast, by acquiring an add-on plugin (Stella for “SEO by Yoast”). It would make Yoast’s plugin expands all its beauty in a multi-language environment, including the generation of a true multi-language xml sitemap ready to be eaten by search engines robots! Apart of some bits and pieces, all seemed to be working fine between Stella, Stella add-on and WordPress SEO plugin. But then, the WordPress team started to release WordPress updates, 3.4, 3.5, 3.5.1… and things started to get shaky with the Stella plugins (debug errors on the admin, some major errors on the frontend). I’m kind of a wanna-be-perfectionist and I don’t like when plugins spit out debug error messages, even if they seem to not affect anything. But it annoys me even more when the project where we’re using this setup is a 400+ pages content website, in five different languages, for a very important customer. So, we decided as a team to re-think the entire plugin’s setup. One of GOMO‘s values as a company is to keep the setups simple and light-weight. 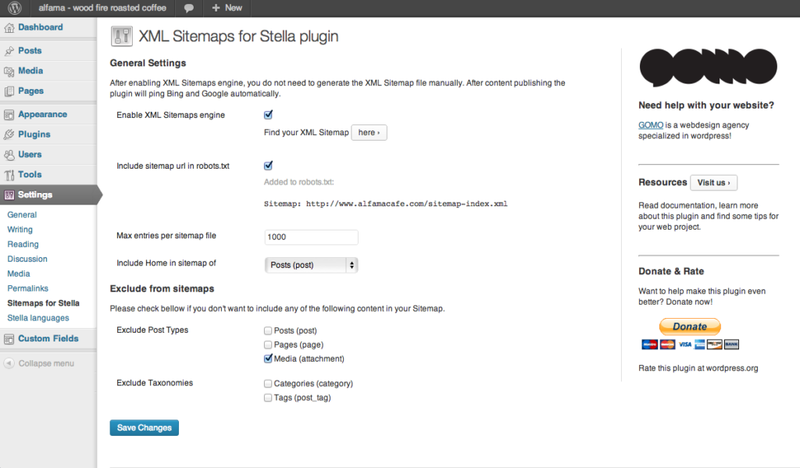 Thus, the first step was to remove the WordPress SEO plugin (and Stella’s add-on). It is a one stop shop for all the SEO related stuff, but in the end we weren’t that much comfortable to have it installed (hey, don’t get me wrong, I personally recommend this plugin). Apart from its dense configuration screen it also added metaboxes in the posts’ edit screen which turned the whole backoffice setup very complex for our client’s usage. Generates an XML Sitemap on your WordPress multi-language website when powered by Stella multi-language plugin. This plugin generates a multi-language XML Sitemap on the fly, automatically pings Google and Bing everytime content is published, and includes the sitemap url in WordPress robots.txt. In a future post I’ll share some thoughts and pressure points I had during this plugin development. I’d like to hear from you guys. What’s your experience with multi-language plugins? Which one would you recommend?